In January 1919, Michael Collins of Sam’s Cross, Clonakilty, West Cork, helped newly-elected President Eamon de Valera escape from a British jail. President de Valera returned to Dublin and then made his way to the States where he embarked on a fund raising trip that brought him to Denver on July 2, 1919. Here, he made an appeal to the ex-pat Irish community for money to help fund the struggles (and, legend has it, to search for the grave of his father, who may have died here of tuberculosis – but sin scéal eile – that’s another story). In November 2011, His Excellency Michael Collins of Dublin (no relation to The Big Fella but also a tall man), Ambassador of Ireland to the United States, visited Denver and displaying a keen wit and grasp of Irish history noted that it only took another 92 years to get Michael Collins to Denver after Dev’s visit. 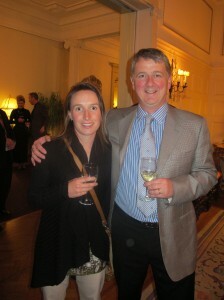 On November 3rd and 4th, Mr. Collins and his wife Marie, accompanied by Consul General Gerry Staunton and with Irish Network Colorado Board President Ciaran Dwyer as an able guide, was shown as much Colorado Irish hospitality, culture, economics and education as could be accommodated in 48 hours. A graduate of Blackrock College, Dublin (the same college attended by President de Valera) Mr. Collins has been a career foreign services officer since 1974 and has served in embassies in Rome, Saudi Arabia and the Czech Republic. From July 2001 to July 2007, he was Second Secretary General in the Department of the Taoiseach with responsibility for International and European Union Affairs and particularly the Northern Ireland Peace Process. In the series of events hosted by Irish Network Colorado with support from members of the Irish and Irish-American communities, Mr. Collins met with Mayor Michael Hancock, staff at the Metro Denver Chamber of Commerce and Metro Denver Economic Development Corporation, Regis University, Metropolitan State College and CU Denver. He spoke at a public gathering in the law offices of Rothgerber Johnson and Lyons, had dinner with members of the community at Strings, the Capitol Hill Denver restaurant owned by Noel Cunningham, visited the facilities at Covidien, an Irish-owned company with facilities in Boulder, lunched with students and faculty at the British and Irish Studies Center at CU Boulder, took a backstage tour of Red Rocks Amphitheater with Barry Fey and attended a reception in his honor at the Governor’s mansion where he met Governor Hickenlooper and his wife Helen Thorpe and spoke to the invited guests. Highlights from his visit were many. A few that stand out include his warm welcome by Jim Lyons, Honorary Consul of Ireland in Colorado and recipient of an honorary doctorate from the University of Ulster in recognition of his hard work in helping with negotiations around the Northern Ireland peace process; his recognition of Mike Sullivan, former Governor of Wyoming and former US Ambassador to Ireland, another major player in the signing of the Good Friday accord and the man who introduced the Stetson hat to Ireland; his visit to the Boulder facility of Covidien, the Irish-owned international medical equipment, supplies and pharmaceutical company with $10 billion in annual sales; his tour of the British and Irish Studies Center at CU Boulder where he spoke to the faculty and staff about his hands-on experiences during the Northern Ireland peace process; the backstage tour of Red Rocks Amphitheater he was given by Barry Fey, the concert promoter who brought U2 to Denver and introduced them onstage when their famous Under a Blood Red Sky music video was made – Barry told Mr. and Mrs. Collins that it’s his voice on the video introducing the band. Mrs. Collins asked if the video was on YouTube. Barry replied, “What – you can’t buy a copy?” Mrs. Collins reminded him that there’s a recession going on; at the reception at the Governor’s mansion, Ciaran Dwyer thanking Horan McConaty Mortuary and Casey O’Connor for providing the transportation for the Ambassador’s visit and got a laugh noting that it wasn’t a hearse; presentations to Mr. Collins of a Michael Collins Pipe Band polo shirt by Jay Leasure and Jim Murphy, a Denver Gaels jersey by Shay Dunne, Kyle Shane and Eamonn Ryan and a letter of welcome from members of the Michael Collins Chapter of the Ancient Order of Hibernians; finally, Governor Hickenlooper’s recognition of Colorado’s strong ties to and connections with Ireland and his making special note of his personal ties through his wife, Helen Thorpe, who was born in England to Irish parents who emigrated to the States when she was an infant – and that Helen, a writer, spent six months doing research for Hollywood producer Jerry Bruckheimer for a film about the life of Veronica Guerin, the Sunday Independent journalist whose stories on the drug trade in Ireland led to her murder in 1996. Mr. and Mrs. Collins, Consul General Staunton and the several hundred in attendance at the reception enjoyed the fine food and drink provided by Noel Hickey of the Celtic Tavern, John Elliott of Scruffy Murphy’s and Diageo North America and mingled until Mrs. Collins reminded Mr. Collins that they had need to retire as they had to be in New Orleans the next day for the opening of the 17th Irish Network chapter – and that the Governor and his wife couldn’t leave until they did – and young Teddy Hickenlooper was waiting at home for them. Barry Fey, the legendary Denver based concert promoter, was a trailblazer in the evolution of live Rock n’Roll. He didn’t just break the trail – he paved the road too – even put vehicles on it and gave them direction. His eye for talent and ability to pitch his product were unequaled. I thought about this last month as I was on my way to pick him up and drive him to Red Rocks Amphitheater. Barry had agreed to meet Ireland’s Ambassador Michael Collins and his entourage at the famous site of the historic Rock video “Under A Blood Red Sky.” The video and accompanying album helped propel Irish Rock band U2 to stardom as one of the most popular band in the world. Barry’s just released book “Backstage Past” gives the behind-the-scenes account of that event and his early relationship with Bono and the gang. It’s full of his first hand accounts of his 30 years growing and cultivating the live concert business and becoming one of the top promoters on the planet. As one would expect from Barry, no punches are pulled. He talks about the Rock Stars, agents, promoters that he liked or hated. You should buy this book – I’m not shilling for Barry, I’m just doing a favor to our readers who, like me, have an interest in the history of Denver, Rock n’ Roll, and the music business. 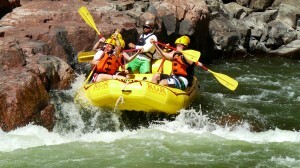 As we drove to Red Rocks his cell phone was ringing almost non-stop. Often it was Phil Lobel, former Student Program Council Director from CU Boulder, concert promoter, and now a publicist in L.A. They were trying to salvage a recent interview Barry did for a London newspaper. Barry gave a candid negative opinion about Mick Jagger’s (Rolling Stone) wife Bianca and she threatened to sue that paper if the story was published. Not backing down, Barry wondered where he could send the story were it could be published. I broke a rare moment of silence and told Barry how excited I was to go up to the Rocks. During my school years I worked as a ‘grunt-out-front’ at Barry’s shows and have so many great memories. It is a very special place for me and I still get an adrenalin rush when I enter the place. Expecting Barry to share my sentiment in-kind, I was surprised that he replied just the opposite – He told me that after doing over 960 plus shows on the Rocks, they did not have of an effect on him. However, by the time we left we both knew otherwise. Steve Eisenstein, Manager of Events form City of Denver, (also a former security/event staff grunt) was gracious enough to meet us at the tourist center at the top of Red Rocks. When the Ambassador and entourage arrived Barry showed them around up top, followed by a tour with Steve into the center. Barry and I stayed up by the front door. I told him a few of my Red Rocks memories but mostly I listened – I did not want to miss a word that he had to say. There were some laughs, but also a lot of bitching and head scratching about the nature of the concert business post Barry. But you can get some bits and pieces about that in his book. After the walk-through of the tourist center, we all drove down behind Red Rocks to the backstage. As we neared backstage Barry became increasingly sentimental – talking about how good Denver had been to him. The backstage door was unlocked along with Barry’s memories of the glory days and everyone enjoyed the questions and answers that ensued. From the backstage area we walked onto the stage and took in the awesome view looking up across the seats to the towering Red Rocks. I turned to check on Barry who was the last one to enter. He slowly shook his head and said, “This is an amazing place.” As he got closer I could see tears running from his eyes. Among all of his attributes as a promoter, Barry was also known for his “management by intimidation” style and gruff exterior. I’ve seen screaming in anger as well as smile at a successful concert. But this show of emotion was the highlight of that day for me. Almost on cue came what I’m sure was Barry’s highlight of the day. From up on top of Red Rocks came a loud shout “BARRY! BARRY FAY!” One of his thousands of his appreciative fans just happened to look down and see the historic Colorado figure on stage. Barry will tell you about all of the stars and famous people he knows, but the most important to him are his legions of appreciative live music fans. “Backstage Past” is published by Richard Wolfe, Lone Wolfe Publishing, and the hardcover is priced $24.94, with a jacket that unfolds into a poster of vintage backstage passes. Sample pages can be viewed on buythisbook.net. Denver University Senior and Golf Team member Sarah Faller hasn’t exactly narrowed down what she will do when she graduates – maybe attend more school, go to work in Finance, teach golf, or if she has a great next 7 months of golf she might consider turning pro. One thing is certain, she has no plans to coast through her last year at DU, she is going to finish with focused intent. Sarah’s achievements on the golf course helped widen her college options in Europe and the U.S.
She spent a year traveling after secondary school and decided that she wanted to continue her education in the States. “I still had itchy feet and wanted to go live somewhere else for a while. The States was an easy solution as I could continue golfing, traveling and get an education at the same time.” After analyzing her personal and family criteria she choose DU. Initially there was a bit of adjustment to make when Sarah moved from Galway to Denver. “Coming from a small town I felt a bit out of my depth for the first few weeks. The great thing about playing on a small team is that it’s like joining a family and that certainly made it easier.” There was also the matter of her Irish brogue. “My friends had no idea what I was saying the majority of the time and I got the nickname mumbles”. Now that she has learnt to talk with a bit more of an American twang it’s the Irish that give her a hard time. “I usually go home for 3 or 4 weeks during the Summer and over Christmas. I get teased for talking American saying “trunk” instead of “boot” and calling the “bin” a “trash can.” Additionally their isn’t as much pride in your university in Ireland as there is over here, and since half my wardrobe has Denver in oversize letters on it I am considered a bit of an oddball! Sarah refers to her older sister Ruth as “brain box” because she is a Trinity College Dublin law student graduate and is doing an MBA program at Smurfit University, but Sarah has proved to be no slouch in the classroom. She has made the Dean’s List, and has been an Academic All American for the past 3 years. Having lived in the States for a number of years, Sarah has gained perspective on the special relationship of Irish-Americans to Irish/Ireland. “America is a brilliant but young country. I feel that a lot of the Irish/America relationship is about establishing history and a sense of culture. It helps that both parties are very friendly and extroverted. It appears that Irish people when they go abroad quickly get involved in their communities and branch out a lot while still maintaining the spirit of home, giving a good impression of what we are about. 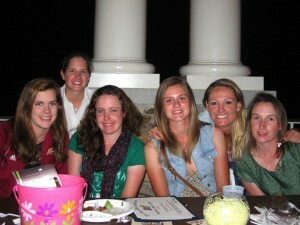 I recently found out about the network of Irish people in Denver, it amazes me how organized and welcoming they are. I wish I had discovered it earlier! So Sarah, you are heading home for the Holidays – other than friends and family, what do you miss most about Ireland? “I miss the heavily sarcastic sense of humor, GAA and Rugby matches and being able to say Aon Sceal (what’s the news?). Andrew Toole knows what it’s like to be in need. When Toole moved to Denver 17 years ago, he didn’t know a soul, have a job or know how he would support himself. “When moving to the States, my mother asked me what I was going to do without a degree from University. I told her. ‘Mom, I’m not scared to chat and I’m not afraid of hard work’”, Toole says. “That attitude has worked for me all my life.” Finding work was difficult without friends or family near, but he found odd jobs while never landing anything consistent. He struggled mightily but continued to work hard at everything he did. Eventually, he realized he was in control of his own success. Andrew, who hails from County Meath, and a few friends caught the entrepreneurial bug and started a business, Ireland’s Finest Painting Company in 1994. As with most small businesses, they initially struggled to get Ireland’s Finest established and fought tooth and nail for every job they won. Andrew’s partners have since moved on to different endeavors, but Andrew continues to lead Ireland’s Finest and makes it the success it is today. Nominees could be families or individuals that are low-income residents, give selflessly back to their community or have lost their jobs. “There are so many worthy people here in our neighborhoods, so picking a winner will be a really tough decision,” Andrew says. Ireland’s Finest will provide all the labor and equipment for the job, while Benjamin Moore, who is a sponsoring partner, will provide the paint. There will be no cost whatsoever to the winning homeowner. The contest will accept nominations through January 31st, 2012 on the Ireland’s Finest website at www.irelandsfinestinc.com/contest. The actual painting of the winner’s house will take place in the spring of 2012. In 2009 President Obama initiated a program called the SAVE Award, (Securing Americans Value and Efficiency). The premise of the program was to seek ideas from frontline Federal Employees to make government more effective and efficient and to ensure taxpayer dollars are spent wisely. In just 3 weeks, OMB (Office of Management and Budget) received tens of thousands of ideas on how to make government more effective and efficient. Over the past two years, federal employees have submitted more than 56,000 cost-cutting ideas through the SAVE Award. Dozens of the most promising ideas have been included in the President’s Budget, specifically in the Terminations, Reduction and Savings volume. Each year OMB narrows the best ideas to a “final four.” Federal employees and the American people vote online to choose the winner. The winner goes to Washington to present their idea to the President. These ideas have to be practical, show significant cost reductions and of course must be cost effective to implement. This year former Denver Gaels Ladies footballer Eileen Hearty from Denver, daughter of Jim and Betty Hearty who hail from County Armagh, Ireland and New York, was one of the final 4 selected by the OMB out of over 20,000 ideas submitted. 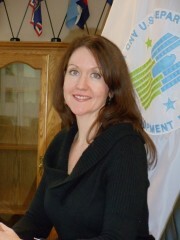 Eileen is a Project Manager and works for HUD (Housing and Urban Development) at their Denver Multi-family Hub. Part of the work that Eileen’s office does is to oversee and regularly inspect properties that the federal government leases from private individuals for programs such as Section Eight Housing. This work is subcontracted out from the Denver HUD office to companies which inspect properties in North and South Dakota, Montana, Wyoming and Colorado. These properties are graded as being Superior, Above Average, Satisfactory, Below Average and Unsatisfactory. Each year every such property is inspected and graded. Eileen’s idea is to reward those properties with a consistently superior or above average rating by reducing the yearly inspections to every three years in the case of Superior properties, and every two years in the case of Above Average properties. If a property gets a lower grade it would then revert back to yearly inspections and as such the standard would be maintained. This in turn would significantly reduce costs to the Federal Government in Travel, Hotels and Man Hours related to inspections and is relatively simple and cost effective to implement. It also allows HUD to focus on those properties which regularly fall below satisfactory ratings and thus improve the overall condition of properties that are used for such programs as section eight. This would make Eileen’s department more efficient, and cost effective. How many times have you heard that about a government entity? Eileen got to have a video conference with the Director of OMB and the 3 other finalists during which President Obama made a personal surprise visit and thanked each of them personally for their contribution. Eileen’s idea was not the overall winner but as one of the final 4 out of 20,000 submitted, it will be implemented. It now goes forward to the Federal Register and will be open for public review where anyone can view and comment on it. This is a wonderful achievement by Eileen and she has the admiration of the Irish American community in Colorado and of course the thanks of the American Taxpayers as a whole for her cost saving idea. Among the row of boutique shops, you’ll find a little yellow cottage on the corner of West Alamo Ave and Curtice Street that beckons you inside -and you should enter. You might think that you stepped though a time/space portal and that you’re somewhere on the west coast of Ireland, but you are actually in Kerreen O’Connor in historic Downtown Littleton, Colorado. It has everything that you might find in an Irish gift shop, and even a bit more. There are treasures of exceptional quality and other novelties designed to get a laugh. Bring your Christmas list because you’ll find something there for everyone. We made a visit to Kerreen’s over Thanksgiving. 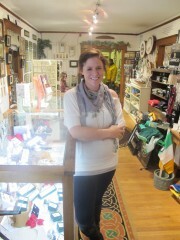 Shop proprietor Lillie O’Connor Shobe and staff had just finished decorating or the Holiday season. Walking through the front door we were greeted by Lillie and a new Christmas display complete with Irish and Celtic ornaments. As we moved about we discovered fun nooks and crannies of barware, jewelry, home décor, apparel, and other themes. There was even a section of imported Irish treats. One gift idea – You can fill a basket to please any taste bud with cookies, crackers, candies, and bread – and of course don’t forget the season’s, favorite Barry’s tea. Looking for a way to spice up your holiday party? Kerreen can outfit you in a traditional kilt eveningwear sure to turn everyone’s heads. (We were advised to tell you to call soon on Kilt rentals as holiday reservations fill up quickly). During our impressive tour Lillie pointed out more gift ideas (or gift yourself! ), from traditional favorites to new items brought in for the Christmas season. On the traditional side, Lillie point out their fine display of Belleek China which is crafted in Ireland and hand-painted. Featured were functional pieces like tea pots, cups, flower vases as well as decorative Celtic crosses or a snowman ornament. Various sizes of Belleek picture frames are available for displaying family memories while incorporating the Irish culture. Along the same line of quality are the Galway Crystal Vases. These are beautiful long lasting pieces and one of the few crystal companies whose operations are still in Ireland. Although Lillie was sad to say that they could not offer the traditional Irish gift of a pint of Guinness, they did have in stock this year’s newest t-shirt styles and wall art for your favorite Guinness lover. “One of our favorite new products from Guinness this year is a gold and grey breathable rugby shirt.” Very nice! There are rare times in life when things seem to happen because they were supposed to happen – as if there was a predestined pattern of individual events leading to a synergistic sort of larger outcome. Not to make too much of a grand thing, but that is surely what seems to have happened with the joining of the musical talents of Margot Krimmel and Beth Leachman-Gadbaw, two of Colorado’s more accomplished individual Celtic performers. A native of Denver, Margot began singing whatever came into her head when she was three and taught herself to play guitar by observing her older brother Max play the guitars he made. Then while living in Steamboat Springs, a friend stored a harp with her, so she picked up the Sylvia Woods book Teach Yourself to Play Folk Harp and began the next stage of her musical life. And what a life it has been. Deciding that the book was only a good start, she went on to study folk harp with Sylvia Woods, jazz harp with Deborah Henson-Conant and classical pedal harp with former Denver Symphony harpist Helen Hope. Honors have included first place awards from the Longs Peak Scottish Highland Festival and the Pop and Jazz Harp Festival and in 2007 won two awards at the New Century Harp Competition: the Best for Beginners Prize for her composition Planxty Earl Grey and a merit prize for her arrangement of Shenandoah. She has released two solo recordings, Songlines and St. John’s Tide, made guest appearances on over 20 albums with a variety of artists including cowboy singer Lon Hannah, guitarist Janet Feder and devotional chant master Robert Gass and has works included in several compilations of harp music. Margot has also written and published music that in a nicely symmetrical turn can be purchased from the Sylvia Woods Harp Center in Los Angeles and Kolacny Music in Denver and continues to teach harp. Born in California and raised in Western Colorado, Beth is one of a set of triplets who grew up with a father who played ragtime piano and a mother with family roots in Kilkenny and Kerry. She sang in choirs in high school and college and after graduation from CU began exploring her Irish heritage at the National University of Ireland in Galway where she studied Gaelic. To deepen her learning, she lived with a family in the Gaeltacht in Connemara and using that as a base, traveled around the south of Ireland to classes, sessions and song circles in Clare and Wexford three times a week for a year. She described it as a magical way to experience and learn the music. In Clare, she met and sang alongside Robbie O’Connell weekly at Cruise’s Pub in Ennis. (Robbie is a nephew of the Clancy Brothers and was just at the Spanish Peaks International Music Festival in La Veta in September.) From Ireland, she made her way to England where she taught music for a year on the border of Devon and Cornwall where she continued her musical growth in the vibrant indigenous folk music scene there. By 1998, she had earned a Masters Degree in Ethnomusicology specializing in Irish singing and met Matt and Shannon Heaton to form Siúcra (shoo-kruh – sugar in Gaelic), a trad group then based in Boulder that toured the country until 2008 when Matt and Shannon moved to Boston. 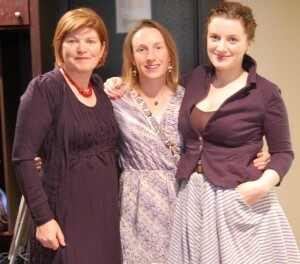 When Billy Bair, Music Director at Colorado Academy wrote a new musical version of the story of Gráinne Ní Mháille, he asked Beth, who he had met through their mutual friend Anne Marie Kennedy, to write some new songs for the show. She performed for a time with Parting Glass, a local trad/eclectic group as lead singer and bodhrán player. In her early career, Beth enjoyed touring, playing at festivals, house concerts and folk clubs. She has opened for Great Big Sea, made guest appearances with the Chieftains, Lon Hannah and the Colorado Springs Symphony and was honored with a Fulbright music award in 2007 and also continues to teach as well as perform. Margot and Beth met in 1998. Beth had just returned from living in Ireland where her roommate had been a Celtic harpist. When she returned to Colorado, she missed the sound so much she decided to take up the harp. Dave Kolacny, Denver’s harp guru, recommended Margot as a teacher. They met, Margot taught her to play the harp and Beth taught music to Margot’s daughter Jordan. Beth and Margot started playing music together soon after they met and very quickly discovered their common love of taking traditional music and putting their own creative stamp on it. An added bonus was that Margot’s harp and Beth’s voice were a match made in heaven. They have appeared together across Colorado and the west and with Beth’s connections have also toured in Ireland and England. 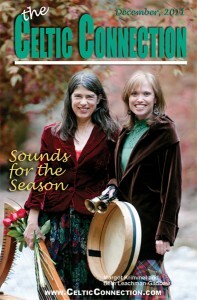 In 2005, they made White Birds, an album with a rich mix of traditional Celtic, American folk and original music that features Margot’s magical harp, Beth’s rhythmic drumming, whistle and bodhrán and ethereal voice, the pleasing union and interplay of their two voices in harmony and guest artists Jean Bolger and Sandra Wong. The title track features words from a poem by William Butler Yeats with original music by Beth and Margot and provided the name for their label. Margot says that “Of all my musical pursuits the work on White Birds with Beth is the apex – at least until we recorded our latest CD, Icy December.” Both were recorded with Jim Ratts at Raven Studio in Englewood and mastered by David Glasser at Airshow Mastering in Boulder, and both projects only deepened her love of music and friendship with Beth. Their latest production is a Christmas CD that is also a mix of traditional music including some carols with additional words and/or music added by Margot and/or Beth, original songs with music and words by Beth and Margot and an original song by Margot. Beth provides the lead vocals, bodhrán, hand bells and hand claps and Margot plays pedal harp and lever harp and harmonies. They are joined by an able group of guest artists including Gaelic Storm’s Jessie Burns on fiddle, Daune Green on riq (a Middle Eastern instrument that looks like a tambourine but has a much richer sound), James Hoskins on cello and Margot’s daughter Jordan Miller on horn. Additional vocal support comes from a musically eclectic group that includes Chris Daniels, Josh Gadbaw, Mary Hoskins, Timothy P. Irvin, Jim Ratts and Salli Severing-Ratts. While many of the songs are familiar, the presentations and arrangements are fresh and reflect the Celtic music overlay of their mutual talents. Their original composition The Donkey and the Doves has a comfortable lilt and the potential to become a new traditional carol. On that song and on the rarely performed When Jesus Lived in Galilee the colors of their voices combine to paint an aurally pleasing picture enhanced by the subtle and effective instrumentation. Margot’s original song Before the Snow weaves a delightful tapestry of sound with her harp, James’ cello and Daune’s riq. Margot’s delicate and energetic harp and Beth’s clear voice on their original Song of Peace and the rest of the songs make this CD one to enjoy with a hot whisky before a warm fire and a grand addition to your collection of holiday albums. 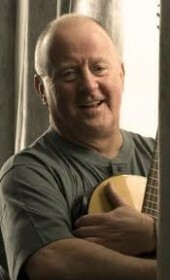 The Celtic Connection’s Cindy Reich caught up with Christy Moore as he was taking a break in west Cork before starting a new tour in the autumn. His latest album, “Folk Tale” was released on the 28th of October. CR—You just finished up your new album—how do you feel about it??? CM—Grand, glad it is done. We started recording a totally different project, which we abandoned and this current project emerged from it. Both Declan (Sinnott) and I are happy with it. CR—Any of the usual suspects in the songwriting department, like Wally Page, or John Spillane or even yourself? CM—No, there’s a few of my own, alright, and I’ve re-visited a few songs from the back catalog. Songs that I’d recorded before and didn’t like the recordings at all and did them again with Declan. CR—When you did them the first time, did you not like them at the time, or when you hear them now, with some time in-between, do you prefer a different sound? CM-Well, one of them was recorded 35 years ago, and a lot of things change in 35 years. And recently, people had started to ask for the song again, so I took it out and looked at it. A couple of the other songs I get requests to do quite regularly but haven’t been doing them. I went back and listened to them and then thought, “That’s why I don’t do them, because I didn’t like the way I was doing them”. I don’t know…I suppose I did them again because I could do it. I was able to re-visit the old work and take a fresh look at it. Not everybody will be happy about that, but it doesn’t matter. CR—At the end of the day, the only person that needs to be happy about it is you, isn’t it? CM—Well, I think myself and Declan. Declan is a songster. 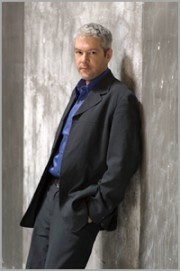 Even though his primary purpose in life as he sees it is to play guitar and to make music, he is very much a lyrics man. He’s a great sidekick, because he goes into the lyric as well and gives me his honest opinion at all times. He kind of feels this is the best album we’ve done. We’ve been recording for 10 or 12 years and this is the 4th or 5th album we’ve done and this is the one he’s happiest with. That counts for something to me. CR—You are very generous with yourself and with your fans. You are very interactive with them on your website—far more than most artists. Do you ever get tired of all the requests, though? The constant requests to come to the U.S. or Australia, or some other request?? You answer the same questions constantly, but always very gently and respectfully. Doesn’t it ever get old? CM—Not really, no. I consider it all kind of a privilege that they are that interested. Occasionally there might be something that might get to me a bit, but never something as generous as that—someone asking me if there’s any chance I’ll come and sing where they live. I got into this thing about five or six years ago and it suddenly dawned on me that for the first time I have kind of an ongoing dialog with people who are into the work. That’s not really happened in my working life before. Even bands—take Moving Hearts or Planxty. Nobody in those bands was as interested in the songs I sing as I was. They were all into their own thing. When I go home—I have a wonderful family—but none of them are that interested in my songs. They love me, thankfully, but around the world are a limited number of people who like the songs I sing and I just consider it a privilege to hear what they have to say. Its lovely. CR—I never looked at it that way, but you’re right. You’re the one most interested in the songs you sing and now you have a shared audience of people who also love the songs. CM—Yeah, for someone to write to me from Australia or America or Canada or Ireland or anywhere—and to say they like the work and they talk about a specific song or tell me their five-year-old daughter loves to sing the song, or their grannie loves the song, I love all that, you know?? Two of the songs I re-recorded are as a result of interaction with listeners. They had contacted me about these particular songs and I went back to both and re-visited them, and it was on the back of that kind of sharing. CR—Well, it’s a two-way street. As one of those people who are really into those songs—to be able to have a dialog with you through the website or with others through the 4711 ( a forum for Christy fans within the website) it’s a rare opportunity to talk with the singer or talk with the songwriter in the case of your own songs. To be able to indulge in the love of the song with the person who brought it to life. CM—It’s something that’s come up in my life in the last five or six years that I cherish. Occasionally there’s a downside—we have been hacked and we have been attacked and we have been abused—but it doesn’t happen very often. Not everybody approves of my interest in it either, but I understand that. There would be people who think I’m a bit ga-ga for involving myself as I do, but I don’t see it that way at all. For me, it’s like having a conversation. Particularly when I’m out on the road, and you go back to your room at night, and the adrenaline is still flowing and you can’t sleep for a while. It’s kind of nice to open the thing up and say hello to a few people. You get requests along the road as well. Someone will say, “I’m coming along next Tuesday night, and it is possible to sing such-and-such… And sometimes it is possible, but most times it is not. Its nice to hear a gig is going to be a special event for somebody for a specific reason, and maybe to be able to respond to that. CR—Does it surprise you at all, or does it put pressure on you when someone writes to you and says, “I’m coming from Australia specifically to go to your gig, or I’m coming from America just to hear you sing”. Would you rather not hear that or does it not bother you either way? CM—Well, I have to say—sometimes it does bother me a little bit. Recently a family—a man and his wife and their two children came from New South Wales (Australia) and the way they wrote to me about it, they were coming specifically to Ireland to the gig. In earlier times, when I read stuff like that it used to freak me out a bit. I used to say, “Don’t tell me until after the gig, please!” you know? But now, it’s just a lovely thing. CR—It’s a testament to the songs. You talked about songs you recorded 35 years ago that people have asked you to take out and play again. You have to think of the durability of those songs. After 35 years, it’s another generation oftentimes coming into these songs and they are discovering them and want to continue to hear them. CM—Well, some of the songs are timeless, you know? Some of the songs I’ve been blessed to encounter are as old as time itself. They are songs that have endured for centuries and people will still sit and listen to them. There is something very sacred in that. They are imbued with some sense of longing or celebration or whatever, and that sensibility just sustains. To me, if I sing “The Well Below The Valley” in 2011 to a thousand people and it stills the night, very much in the back of my mind would be that this song would have been sung over a thousand years ago—albeit in different circumstances—carrying the same effect of stilling the night. And every time I sing that song, I’m filled with emotion. The same with “Lord Baker” or “Little Musgrave”or “Cliffs Of Dooneen”—these kind of timeless songs. There are modern songs as well, songs that have been written of late, also have that. And I know some of those songs are going to live on and on. CR—You have some of your own songs that have stood the test of time as well. Is there any song of your own that you might put in that category? That seems to have those same qualities? CM—Well….maybe… but time alone will tell. It’s less than 40 years since I wrote my first song and I’ve only written maybe 100 songs in 40 years. I don’t write that much. I’m just interested in songs whether you write them or I write them or they are ancient is immaterial to me. But I suppose you do get a bit of a kick out of singing your own song, alright..
CR—But your not being precious about it. There are people who are good singers, there are people who are good songwriters, there are some that are both, but a good song, regardless of who writes it, is one that has that power to evoke the emotion to create the space that you just spoke about. And I think in your catalog are some songs you have written that evoke that moment. And its not a question of quantity, its quality. You could have written one song in 40 years, but if it was a mighty song, so what? It’s the power of the song, not the number. CM—I know instances of people who have written one great song. I think of Phillip Stewart who wrote that song, “Away You Broken Heart”. CR—Is that maybe one of the songs that your are bringing back out on the new album?? I’ve hardly ever heard you sing that song in a live situation. CM—No, I’ve done it maybe once or twice in the last five years. Its one of those songs that just every now and then comes out. I never examine why it comes out, but when it does come out, it means something. I certainly sang it once in the last year, and it just appeared. And it stilled the night. And it created a really powerful vibe. “Away you broken heart”… Stand me somewhere near the ocean…I will wait there wave after wave.” I got that song from a woman who delivered it to me in a real roundabout way. It was about 10 years before I actually met the writer. I never heard a song of his and I don’t know if he ever wrote another one. CR—You listen to a wide variety of music, and you go and listen to other people. You go to singers clubs on occasion and listen to people. Your tastes are varied and I think it brings a certain fullness to what you produce because you are not stuck in one particular spot. You have a wide curiosity about different types of music that are out there. CM—I kind of view it from the other angle. I see it as being really narrow, as the only thing I am listening for is the emotion in a song. I don’t care what genre it’s in. If the song does the business for me or makes me close my eyes and takes me away somewhere… Or if it makes me laugh or makes me sad or if it makes me want to sing it. So in a way, my tastes aren’t that varied. All I’m listening to is the song. That’s what I want. CR—I hadn’t thought it in that way, because they come from many places, but there is a common thread in your songs that you sing and it is that emotion. And I think that is why, 30 years, 40 years down the road, people still come back—to the old songs from 30 years ago, but also to new songs from two years ago. There is some fundamental emotion in those songs that are grabbing those people at a visceral level that make them go after those songs themselves. CM—For some reason, when you were talking there, I started thinking of Woody Guthrie and Bob Dylan. The Woody Guthrie songs I sing are songs that can make me cry. And the same with a few Bob Dylan songs I’ve sung. Some nights they nearly make me cry. And they aren’t the famous songs or the well-known songs, which I can kind of listen to, and like. But every now and then I hear a song that just makes me cry. Or makes me laugh, or makes me happy. It’s a wonderful world, the world of songs and music, and its such a privilege to be a part of it. CR—But isn’t that the effect they’re supposed to have? So much of modern music is manufactured in a certain way to present a certain sound to the greatest common denominator. There’s no emotion, no connection—it is what it is. But the power of the song should be what you just described. It evokes an emotion in you that takes you outside of yourself. CR—Now there’s some you don’t sing. You talked about songs that make you cry and I remember you saying once that you can’t sing “The Boys Of Barr na Sraide” anymore, because it is just too sad. CM—Well, with that particular song, it wasn’t that…there’s a song called “Kilkelly” that I couldn’t sing because it was too sad. I sang “Barr na Sraide” for quite a long time—what turned me against it was that kind of pagan celebration of the killing of the wren. And I just got turned off by that, you know? “..and on St. Stephens Day, went out and we killed the wren…” Even though it’s an ancient ritualistic thing, I got real uncomfortable singing about it. I don’t think I’ve spoken about that before. Its just when you mentioned it.. Originally when I learned “Barr na Sraide”, I was very caught up by some of the verses in it—by people caught up in dark exile. The heartbrokenness of dark exile. But what eventually what killed it for me was the poor little bird getting killed on St. Stephens’ Day. CR—The bird was harmless—it hadn’t done anything. CR—Up with the kettle and down with the pan, give us a penny to bury the wren…. CM—The wren , the wren, the king of all birds, on St Stephens’ Day was caught in the furze. Up with the poker and down with the pan, give me a sixpence to bury the wren..
You have it, fair play to you, you have it. CR—Not bad for a Yank. I want to only bring this up because it created such a stir, and it cracked me up. CR—When you played with Coldplay at the Oxegen Festival this summer. I thought it was absolutely brilliant!!! If someone had told me that Coldplay had been performing “Ride On”, with or without Christy Moore I would have laughed my head off. CM—When Will (Champion) the drummer, was 12, his mother took him to a gig of mine in Southampton. And at 12, he came to that gig and he always remembered it. He loved that a guy came out on a stage with an acoustic guitar came out and made a big racket. He started coming to my gigs, and he’s come along on and off ever since. And I think it was through Will that the band invited me to share their stage and it was a lovely experience and it was great fun! CR—I’ll bet it was, and you just introduced to a new legion of listeners—whether they come along or not, its something new they were exposed to. But there are several things I really appreciate about you that make you stand out. One, is your ability to convey the emotion you that you feel in the songs. I think that is one of the things that make you such a powerful singer and why they get affected at your gigs when you sing. And when I say emotion, it can be sad or it can be raucous and fun. The other is your social conscience and the way you use your ability to speak for people that have no voice, and thirdly, that you can translate through generations. So at a Christy Moore gig there will be grannies with white hair and five-year-olds sitting on their daddy’s lap, singing the songs. There will be 16 year olds, and 25 year olds and 70 year olds…. That is quite rare. You don’t see that at a lot of gigs. songs. It blew me away. CR—And those are not simple songs! CM—That’s the thing about it! They’re quite complex and difficult songs. CR—It’s a gift to be able to connect with a five-year-old and a 55 year old with the same songs. And we’re blessed to have you share that gift. CM—All gifts are given. Everything is given and some of us are blessed to have been able to accept them and hand them back again. CR—Which you do. You give back in spades. But lets talk about your social conscience. You have a deep social conscience and you use your voice for those who have no voice—whether it be travelers rights or pedophilia, for example. That you are able to take what are often difficult or sensitive subjects, given the country you live in, the demographics or whatever, and you are keeping these subjects in the public eye. Is that innate in you, or did you pick it up from singers such as Woody or Bob Dylan or did you just feel that you needed to speak out for social injustice? CM—I never analyzed it to tell you the truth. I became aware of a certain kind of song when I was quite young. I heard songs of struggle as a small boy, but at the time I didn’t know they were songs of struggle. When I heard Woody Guthrie and I heard Ewan McColl and I heard some of the songs Luke Kelly sang, something was awakened in me—the fact that struggles were still going on. It was o.k. to sing about historical struggles, but wouldn’t it be really, really good to be singing about the world we live in now? About 1965, 1966 I realized that. And it kind of brought me around in that direction a bit, but the beginnings were there from the time I was a boy. It’s a bit like that song about Victor Jara. “..his hands were gentle, and his hands were strong..” and it describes how he grew up listening to his mother singing. There would be a bit of that in my story as well. They’re back! By popular demand, Gaelic Storm blows back into Colorado Friday November 11 and Saturday November 12 for two raucous, crowd-pleasing performances at the Stargazers Theatre in Colorado Springs, and the following night in Denver at the Gothic Theatre. Don’t miss this opportunity to sing along with one of the hottest Celtic bands firing up the stage in performance venues across the country! Gaelic Storm’s popularity skyrocketed after they appeared in James Cameron’s epic film, Titanic as the Irish party band in the ship’s steerage. Since then, the band has amassed a large, loyal and ever-growing following. The band has flourished in an extreme DIY fashion by not only launching their own label, Lost Again Records, and releasing their albums themselves (several albums on Top-5 of the Billboard World charts) but also by designing all their own album art, posters and advertisements. 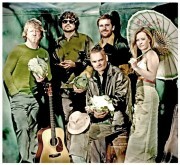 While Gaelic Storm plays Celtic music that hearkens back to the traditional music of Ireland, they are hardly traditionalists, adding modern sounds and drawing influences from American rock and pop as well as music styles from around the world. The band has made countless television and radio appearances, and there are official videos and heaps of fan-posted live YouTube clips (often with the crowd singing as loud as the band). Be There when the “ever feisty” (Phila. Daily News) GAELIC STORM, will serve up a “whirlwind ruckus” (Village Voice) at the Stargazers Theatre on Friday November 11th and again Saturday November 12 at the Gothic Theatre. Gaelic Storm is: Patrick Murphy (Cork City, Ireland) Vocals, Accordion, Harmonica; Steve Twigger (Coventry, England), Vocals, Guitar, Bouzouki; Ryan Lacey on drums and world percussion; Jessie Burns on fiddle (Suffolk, England – lives in Colorado) and Pete Purvis ( Merrickville, Ontario) Uillean pipes, tin whistle, daeger pipes and highland pipes (a Grade 1 piper who toured with award winning pipe bands). www.stargazerstheatre.com or by phone 719-476-2200 (subject to service and handling fees). BELFAST – Ireland I’m standing in the middle of an ever-growing crowd of people here in Northern Ireland and a sense of great excitement is heightening all around me. All of a sudden I am emotionally involved in the whole of it as we are thrown back in time, to May 31, 1911. I can actually feel what it must have been like for the folks whose lives played out so enormously here at this famous shipyard of Harland & Wolff, birthplace of the Titanic and, at the time, the largest shipbuilding company in the world. Powerful voices of combined gentlemen choirs are performing the soulful Naval hymn. Youngsters, boys and girls from surrounding schools, dressed as newspaper boys of that day, faces smudged with ink, are preparing to do their part in helping recreate this event. Then, at exactly 12:15 pm, a shot rings out. Voices reach high pitch and everyone cheers mightily, much as they did 100 years ago when the mighty RMS Titanic slipped into the waters of River Lagan at her launching. It was an experience I know I won’t forget. Today a certain sense of expectation continues as Belfast positions itself for its role on the world stage come April 15, 2012 when it will commemorate the hundredth anniversary of what we have come to know as an unforgettable human tragedy, the sinking of the RMS Titanic on her maiden voyage to New York. 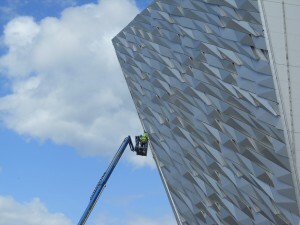 Never ready to forget the lives lost, or how the lives of those who built Titanic were such an intimate part of the story, and how it all played out in history, Belfast is hard at work readying itself for the event. Front and center is the ongoing construction of Titanic Belfast, a 97million British pound project that promises to be a “must-see” not only for the half million visitors expected next April, but also going forward as a permanent piece of Belfast history. This spectacular, 6-story, state-of-the-art structure, with an exterior design that represents the bows of three ships, will take visitors on a start-to-finish tour of the vessel’s construction, launch, maiden voyage and tragic end. Also here in the Titanic Quarter, as the area is known, is the original SS Nomadic, one of 2 tenders that served the passengers of the Titanic. Nomadic was responsible for taking the ‘Lords, ladies, luggage and servants’ of first and second class passengers from Cherbourg, France, to the ship, while another vessel, the Traffic, ferried third-class passengers. The Nomadic was quite elegant, much smaller but similar in décor to its legendary counterpart, even to the small staircase, a copy of the one we have come to know thanks to films about the Titanic. It has been stripped down to be totally restored according to the designs and drawings of the day. It’s an unknown piece of history I found quite interesting. Another integral piece of the story not-to-be-missed can be found at the world-class Ulster Folk & Transport Museum, located close by on 170 acres of Belfast’s countryside. Here all things Titanic (Titanica) can be viewed. The story of the White Star Line, the owners, the designers of the ships of the day, the drawings, photographs, and artifacts from the era, along with those found on the ocean floor. From road, rail and air modes of transport, on to the various buildings out-of-doors, visitors get a peek at life as it was lived back in Edwardian times. It’s a great exhibit that’s worth spending the several hours it takes to get to see most of it. You might also find information about the Ulster Folk & Transport Museum on Facebook, Twitter and You Tube. Personally, I have to admit that visiting Belfast was never on my list of places to see in Ireland. Its sad history of dark days of intimidation and despair never resonated as a welcoming or safe place. The actual experience, though, was far from what I and other attending journalists had envisioned. To a person we agreed that Belfast was fascinating, its people warm and welcoming, and any visitor would feel totally at ease getting into the rhythms of the city. The eclectic mix of things to do and see, the grand architectural styles of its beautiful buildings such as City Hall, its churches, beautiful hotels, fine museums and cultural sites, its authentic Pubs and fine restaurants, are things any avid traveler will enjoy. Interestingly, back in the 1900’s Belfast was one of the most prosperous industrial cities in the world, famous for its rope factories, cotton and flax, and being the world’s largest producer of linen. Great design skills and quality workmanship produced world-class steamships even though most of the necessary raw materials had to be imported. Over 30,000 people worked at Harland & Wolff at the time. Thanks to its energy, innovation, and well-organized working conditions, Belfast was at the pinnacle of success. As for the future, once again it’s set to impact Ireland and the world. Samson & Goliath, two iconic, yellow cranes still standing in the shipyard at H & W, are now involved in the production of wind turbines. Projects going on within Belfast promise an increase of tourism to the area. The city itself is a place of wonderful contrasts, historic and beautifully old, yet cosmopolitan, trendy and new. And since food plays such a major part of travel, it’s important to know that all of Ireland possesses a world-class dining scene that’s on the ascendancy. Forget those former ideas of bland, Irish cooking because dining, along with entertainment and a lively nightlife, is alive and well in Belfast. Suffice it to say, if you, too, are fascinated by the story of the Titanic, you might include Belfast in future travel plans, remembering that anytime is a good time to visit this new, up-and-coming, old city that’s making history all over again. Visit www.tourismireland.com for information about travel to Ireland. Visit www.discovernorthernireland.com for information about Belfast. Coming next; Part II, North from Belfast. If you ever wanted to be music mogul, now’s your chance! Solas are embarking on a new multi-media project and are inviting anyone and everyone to get involved. Through the “Kickstarter” website, http://www.kickstarter.com/projects/1490987662/shamrock-city , they are hoping to raise the money needed to fund this project. The beauty of Kickstarter is that there is a finite period of time to raise the money and if the full amount isn’t committed, no one pays. You only pay if the money has been raised by the deadline. You can contribute any amount from one dollar on up, and there are special premiums you will receive, based on your donation. For as little as $10, you will get a pre-release digital download of the new album. And it goes up from there, all the way to a Solas house concert ($10,000). In between are signed copies of the album, tickets to upcoming gigs, meet and greet at gigs, t-shirts, a custom-made bodhran and more. So the party is set for October 27 at Eron Johnson’s Antique Warehouse 389 South Lipan, Denver. The Event is free; Doors will open at 6:30P for a little social hour and then at 7:30P we’ll see if we can create a few tidy sets across the room. Bring a song, tune, or your dancing shows. We do request a RSVP by October 25th so contact us now at numbers below. Jerry is a founding member of the Brooks Academy Dancing School established in Dublin in 1982 and is still actively involved teaching a weekly dance class. 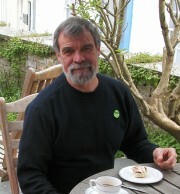 He is in demand as a teacher/caller all over Ireland, the U.K., Europe, The United States and Canada. 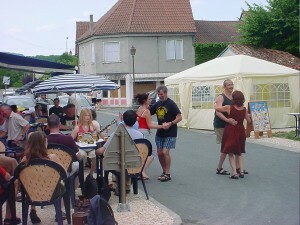 Jerry has taught dancing in Paris to the Association Irlandaise annually since 1988, at the Willie Clancy Summer School since 1984, at Wadebridge in 1998, at Sidmouth in 1999 and at Whitby Folk Week every year since 2000. He also gave instructions for sets at the North American Convention of Comhaltas Ceolttoir-Eireann in Washington D.C in 2000, and paid a return visit there in December 2001. He was also called upon to teach dancing at ‘Feile Cois Chuain’ in 2004, The North Atlantic Fiddle Convention in Aberdeen in 2006, and has recently returned from teaching at the North Atlantic Fiddle Convention and the Newfoundland and Labrador Folk Festival in St. Johns, Newfoundland. A noteworthy Irish traditional singer, Jerry was exposed to the music at an early as by his family. “I’ve been listening to songs and singing all of my life. My first memories of singing were in my paternal grandparents’ house in Pembroke Cottages in Donnybrook. If Jerry shows up October 27th wearing blue he has a good reason. Well, we’ll have to tell him about our Denver Gaels! No charge for this event but donations will be accepted for the instructor. Thursday October 27, 6:30P Doors.